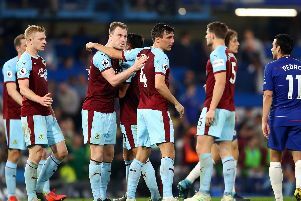 Substitute Sam Vokes scored the only goal of the game as the Clarets beat the reigning champions 1-0 at Turf Moor. In an entertaining game, which the Clarets controlled for large periods, it took until the final moments of the game for the breakthrough to be reached. Sam Vokes scored his first Premier League goal in 11 appearances to ensure the Clarets once again left Turf Moor with all three points. Here's how it happened.